Server2012 R2 update also causing this error? I found in this post that there is a cumulative update for windows causing issues with bar-codes readability. I have the same setup on lower versions of OS that are working, but for some reason on Server2012 R2 the ADVC128C.TTF bar-code is generated, but seems truncated and not able to scan on a bar-code scanner. I am curious if the same issue in the post below could be causing my issue as well? When scanned the code128 barcode should translate to 1705010013 but the bar-code appears truncated on the Server2012R2 environment. I am not quite sure if it is the same issue. 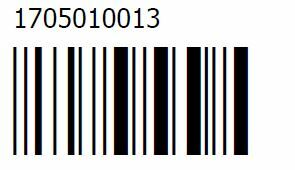 Set the barcode font to Arial instead of the IDAutomation font and then send a screen shot of the encoded data. Verify that you are using the most recent version of the IDAutomation Code 128 fonts and .NET Assembly. The ADVC128 fonts are a little over 14 years old.